Proclear Toric XR are monthly lenses designed to correct high levels of astigmatism. This value package contains two boxes of three lenses each and a 360 ml bottle of Gelone solution with an antibacterial lens case. Proclear Toric XR are produced by CooperVision for the correction of high levels of astigmatism. These lenses offer higher cylindrical values (from –2.25 to –5.75) than standard toric lenses, and provide clear, comfortable vision for users previously dependent on glasses. 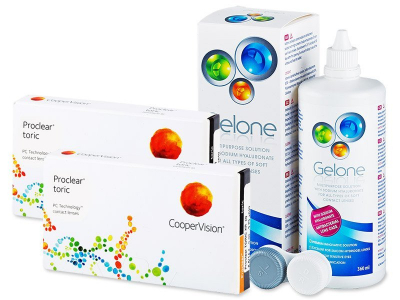 The package contains two boxes containing three lenses each and one 360 ml bottle of Gelone Solution. CooperVision does not recommend sleeping in these lenses.